True to himself and to his roots, legendary slide roller goes further on up the road. 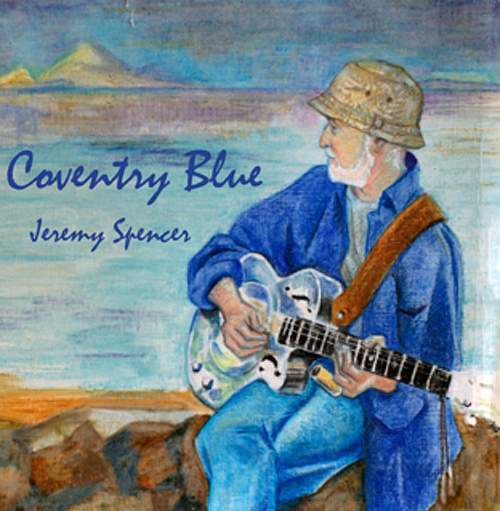 A painter as well as a musician, Jeremy Spencer knows the meaning of “blue” too well to ignore the link between his chosen musical genre and the dye signifying loyalty that doesn’t wash away with years, and if there is such a link the British guitarist might well be it. From here, sprung the idea of this album, recorded during the same sessions which resulted in 2012’s "Bend In The Road" yet shaped differently, lighter on covers and in a much lighter mood. To feel it, one should reach for the humorous “Moonshine Slide”: it doesn’t imply bootlegging – in the booze kind of way, as Jeremy’s had his share of unsolicited releases from his FLEETWOOD MAC stint – but refers to the blue ceramic tool that Spencer moves over the fretboard, although the country-tinctured opener “Happy Troubadour” is as brimful with twangy merriment. Still, life-affirming as the record is, “Letting Go Of The Past” turns its bittersweet message upside down, hailing from the late ’70s and given now to a twin-axe cut and Rachel May who pours additional soulfulness into the ivory-spiced mix, while a couple of tunes hark back even further. MAC even performed “Open The Door” with Danny Kirwan and Christine McVie just before its writer left the band, yet now the song receives a Stax-like studio treatment, unlike the spaghetti western of “Durango” which was also written in those days. That’s when “Got To Keep Movin'” comes into mid-paced play to hint at a certain Robert Johnson classic, albeit this time there’s no hellhound on Jeremy’s trail; perhaps, that’s why Spencer revives “The World In Her Heart” from the LP he released in 1972 with CHILDREN OF GOD but renders the piece in purely instrumental, rather heavy, form. Here, the veteran’s acoustic lace weaves around his co-producer Brett Lucas’ electric jive, whereas the main man’s piano sets tension in the almost orchestral “Sweet Were The Days” and, taking up the riff, brings unexpected elegance out of Buddy Holly’s “Dearest… Umm Yah.” It’s not as cinematic as the old-timey strings-and-accordeon sway of “Sounds Like Paris” or the elegiac “Send An Angel” – one to make Ry Cooder cry – and not as bare-bone as the title track: unplugged, if deeply rooted in tradition, it reveals the real depth of Jeremy Spencer, the master who defies the time.